On the evening of Feb. 1, the Jewish Community Centre of Greater Vancouver was buzzing with activity. Students, parents, volunteers and others gathered for this year’s Public Speaking Contest. Participants came from Richmond Jewish Day School, Vancouver Hebrew Academy, Vancouver Talmud Torah, Crofton House, General Gordon Elementary, Madrona School, Temple Sholom Hebrew School / Sir James Douglas Elementary and home school / Chabad of Richmond. Among the many topics suggested were Jewish values, holidays and mitzvot, what institution should be established first if creating a new Jewish community from scratch, whether Jerusalem or Tel Aviv is more reflective of modern Jewish identity, which prayer might be added to the synagogue services and what would be included in a YouTube video highlighting the Vancouver Jewish community. Participants could also write about a family member they admired, their favourite biblical character or a mensch they know; they could also pick their own topic. At the Grade 4 level, there were two groups, in which Sivan Hendel and Noah Robibo placed first; Danielle Kimel and Maytal Bunim second; and Maayan Greif and Hannah Friedlander third. In the two Grade 5 sections, Rivka Feigelstock and Sophia Krische placed first; Chasya Berger and Shira Oirechman second; and Max Dodek and Eden Pretli third. In Grade 6, Aaron Guralnick and Rachel Marliss were first; Ruby Harris and Devorah Leah Yeshayahu second; and Tali Keil and Oliver Kraft third. In the Grade 7 category, there was just one group, with Maya Mizrachi placing first, Noah Berger second and Alex Ritch third. In the Hebrew category, Yair Cohen placed first and Roi Gadassi second; there was no third-place award. 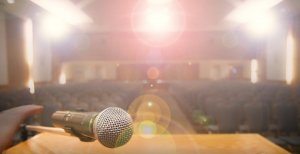 Based on the numbers alone, the 27th Annual Public Speaking Contest on March 19 at the Jewish Community Centre of Greater Vancouver was a success. Participants: 120. Prizes: 30. Volunteer judges and moderators: 30. Founded by Larry Barzelai in memory of his father, the event was co-sponsored by Jewish Federation of Greater Vancouver and State of Israel Bonds, with additional support from the J and the Isaac Waldman Jewish Public Library. As one of the volunteer judges, I witnessed a well-organized event that thrived on controlled chaos – almost all of those 120 student participants were accompanied by family and/or friends, and in the crowd were potential future speakers and their parents sussing out what participating next year might be like. “My father, Morris Black, alav ha’shalom, would be very pleased to see the legacy he created,” Barzelai told the Independent. Indeed, he would. Speakers were from grades 4 through 7, and they had their choice of topic from a list of 10, one of which was to choose their own. The most popular choices in the Grade 4 class I co-judged were to create a day to mark an event from Jewish history that is not currently being celebrated or commemorated; to describe an app that would enhance Jewish studies at your school; to explain why recycling is a Jewish concept; and to explain what you think is/are the best innovation(s) to have come out of Israel in recent years. The enthusiasm of the competitions taking place in rooms around the J was corralled in the Wosk Auditorium afterward, and Alex Konvyes entertained the excited students and their guests while the results were being tallied. As each winner was announced, huge cheers went up. As some winners read their speeches, the auditorium came to a hush. “Several parents in attendance this year had previously been public speaking contestants in their youth, so the legacy continues,” Barzelai noted. While pleased that “the contest continues to be healthy” and that it is strongly supported by the principals and teachers of the three day schools – Vancouver Talmud Torah, Vancouver Hebrew Academy and Richmond Jewish Day School – Barzelai expressed concern about “the inability to attract students from Jewish supplementary schools and students that are not affiliated with Jewish schools. In former years, the contest had a wider cross section of students,” he said. Hebrew: Omer Murad (Grade 4, VTT), Ofek Avitan (Grade 5, VHA), Yael David (Grade 4, VTT). Grade 4: Rachel Marliss (RJDS), Mendel Bitton (VHA), Jesse Millman (VTT). Grade 4: Zac Peter (VTT), Ellis Jackson (RJDS), Chase Dodek (VTT). Grade 4: Aaron Guralnick (VTT), Cassie Porte (VTT), Devorah Leah Yeshayahu (VHA). Grade 5: Ava Abramowich (VTT), Benjamin Gutman (VTT), Elana Robibo (VTT). Grade 5: Sarale Bitton (VHA), Adin Tischler (VTT), Rubi Katz (VTT). Grade 5: Alex Ritch (VTT), Shoshana Pollock (VTT), Tristan Georges (VTT). Grade 6: Menachem Yeshayahu (VHA), Riva Berger (VHA), Mordechai Wolfson (VHA). Grade 7: Eva Dobrovolska (VTT), Neev Mizrachi (VHA), Teah Bakonyi (VTT). Grade 7: Avrel Festinger (VTT), Romy Ashkenazy (VHA), Elliot Pollock (VTT).